Envision Planet is an interactive networking site designed to help high school students envision their future, use the tools and the community at the site to plan for their future and network with mentors to make it real. We’ve built many sites for serial entrepreneur George Johnson (e.g., SparkAVision; TelAVision (and its .org site, now offline); Entrevis and several more). 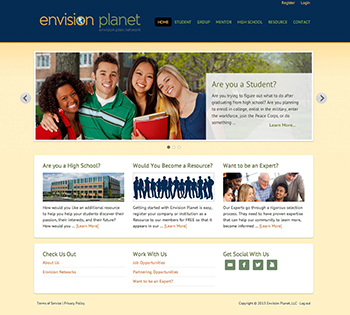 Innov8Press created the Envision Planet “front-end” site in WordPress and is acting as the design manager for the Drupal-driven networking site.